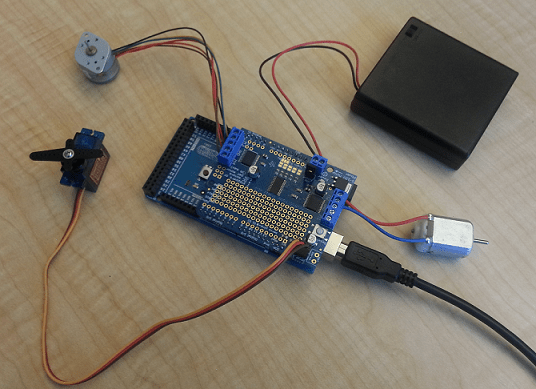 This example shows how to use the MATLAB® Support Package for Arduino® Hardware to control servo motors, DC motors, and stepper motors using the Adafruit Motor Shield V2. 1. Attach Adafruit motor shield to your Arduino hardware. 2. Connect an FS5106B motor to servo motor port 1, labeled 'Servo 1' on the shield. 3. Connect a DC toy/hobby motor to motor port 1, labeled 'M2' on the shield. 4. Connect a six-wire Portescap stepper motor to motor port 2, labeled 'M3' and 'M4' on the shield. Connect the two middle wires on the stepper motor to the center of the port to ground them together. If you are using four-wire or five-wire stepper motor, check your hardware specs for appropriate connections of each wire. 5. Connect a battery pack that has three AA batteries to the DC jack, labeled with Power and remove the jumper on pins labeled Vin Jumper. This step is optional if your stepper motor does not require a high power supply. By default, the Adafruit\MotorShieldV2 library is not included in the server code on the board. Create an arduino object and include the Adafruit\MotorShieldV2 library to the hardware. Updating server code on board Uno (COM4). This may take a few minutes. The I2CAddress of a shield is set to 0x60 by default if not specified. Search for available I2C addresses on bus 0 to specify a different address. There are two servo motor ports available on each shield. To create a servo motor object at port 1. Set the position of the servo motor's shaft to its maximum position. See Control Servo Motors example to learn how to use a servo object. There are four DC motor ports available on each shield. Create a DC motor object at port 2. First, change the motor speed to 0.2. The sign of the value indicates the direction of the motor rotation that also depends on the wiring of the motor. Start the motor and change the speed while it is running. Stop the motor when you are done. There are two stepper motor ports available on each shield. To create a stepper motor object at port 2 with 200 steps per revolution. Set the motor's RPM, e.g revolutions per minute, to 10 and move or step the motor 200 steps in one direction and then another 200 steps in the reverse direction. Once the connection is no longer needed, clear the associated object.